What an absolutely spectacular night it was at City Hall in Cardiff, on Thursday 21st March. We straightened our ties and placed on our ball gowns, ready for an evening of celebration for everything we’ve achieved over the last 12 months. 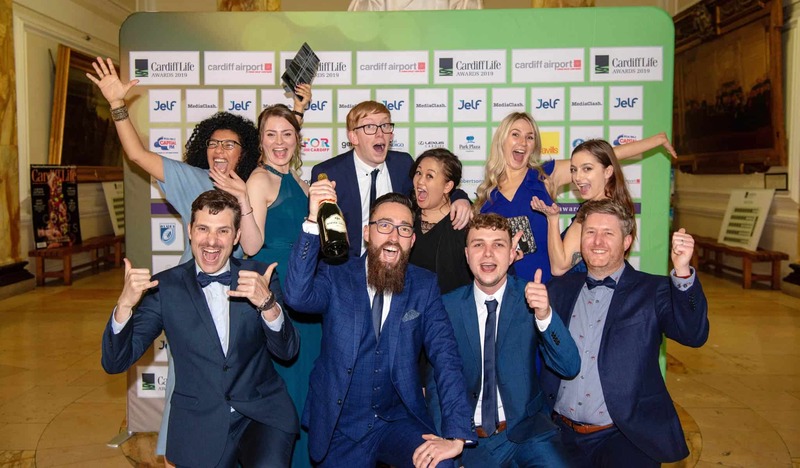 It’s a true honour to have stood alongside some other notable brands, business and charities from across Cardiff, to be recognised for our contribution to our city and to have built a team of people who love the work they do and for the people they do it for. When the team work so hard each day to display our very best work, the award is a testament to their passion for what we work to achieve for our clients and for the wider WordPress and development communities. Equally, it also represents the projects that our amazing clients give us the privilege of working on, bringing interesting challenges to our team and engaging with us collaboratively to create impactful website experiences. We’re grateful that we get to do this each day, with amazing people, who understand what it means to work together to achieve success. To have won in the ‘Business Services’ category is important to us, as we don’t just see ourselves as creatives who are producing something visually appealing; we’re aiming to improve and add value to the businesses we work with and this award captures our drive to achieve this and shows that our efforts have been noticed so far. As the MD of this amazing company, I’d like to echo what I said on the night, a big thank you to the team who are culture creators and make it possible to put a smile on client’s faces when delivering their websites. And an equally big thank you to our clients and partners for coming on this journey with us, for spurring us on to do great work; it encourages us to keep striving to deliver the best for you. What’s next for us at Illustrate Digital? Getting our heads down and stuck into even more great work, challenging work! We’re looking to add more value to Cardiff and beyond, to keep employing great people in our city and to reach new heights together. If you have a UX design, development or integration project that you’d like us to take a look at, or a website that needs to be maintained, then get in touch as we’d love to help. Want to see what makes us an “award winning agency?” Check out our projects.